If you want to enjoy Universal Orlando when it would be less crowded and when Florida’s weather would be cooler and more accommodating, then head to its theme parks and resorts in January. As a bonus, you could score some of the lowest rates of the year at Universal’s on-property hotels. The holiday events that the parks offer in November and December end in January, and the seasonal decorations come down. But, the celebration typically continues into the first week of the month. For most of January, the theme parks, Islands of Adventure and Universal Studios Florida, are generally open ten hours each day, typically from 9 a.m. to 7 p.m. During the first week of the month (to accommodate residual crowds from the holidays) and over the Martin Luther King Day weekend, the parks are usually open longer. Because it is the off-offseason, and the days are shorter, the Volcano Bay water park is generally open seven hours each day, from 10 a.m. to 5 p.m. The following temperature averages can help you get a rough idea of what the weather would be like in January and are helpful for planning months ahead of time. January tends to be the coolest month of the year, but the days are still comfortably warm. It is not the rainy season, so you should be able to maximize your time in the parks without any weather interruptions. At the extremes, Orlando’s record low temperature was 19 degrees F, and its record high was 87 degrees F.
Either long pants or shorts would work. If you are planning to stay at the parks all day, you’ll want to bring layers as it would likely be cool in the early mornings and late afternoons. Regardless of the time of year, you should bring comfortable footwear as you will be doing a lot of walking. While rain is unlikely, bring along a hooded rain jacket or a poncho if it is forecast. Even if it doesn’t rain, the rain gear would come in handy for the water rides at Islands of Adventure. Florida residents generally steer clear of the water in January, but if you are a hardy visitor from a colder climate, you may want to enjoy Florida's relative warmth and enjoy the pool at your hotel. Or you may want to check out Universal's wonderful water park, Volcano Bay, which remains open, weather permitting, throughout January. If that sounds like you, be sure to bring along a bathing suit or two. Ring in the New Year with Eve, a party at Universal CityWalk. This event features live music and DJs, unlimited food, and special parties at CityWalk's clubs and at an outdoor stage. Note that the event is for guests 21 and over and requires a separate ticket. The holiday events, including Christmas in The Wizarding World of Harry Potter, The Grinchmas Who-liday Spectacular, and Universal's Holiday Parade featuring Macy’s, generally continue into the first week of January, depending on which day New Years falls. In past years, Universal presented a Harry Potter celebration in January, but it has ceased the event. January is one of the least busy times of the year to visit Orlando, Florida, so you should take advantage of the low crowd levels this month and enjoy some of the resort’s best attractions like Harry Potter and the Forbidden Journey with minimal waiting in line. You wouldn’t need to splurge on a front of the line pass this month as lines should be reasonable at both Islands of Adventure and Universal Orlando. But you would want to purchase the multi-park ticket so that you can ride the popular Hogwarts' Express between the two theme parks. 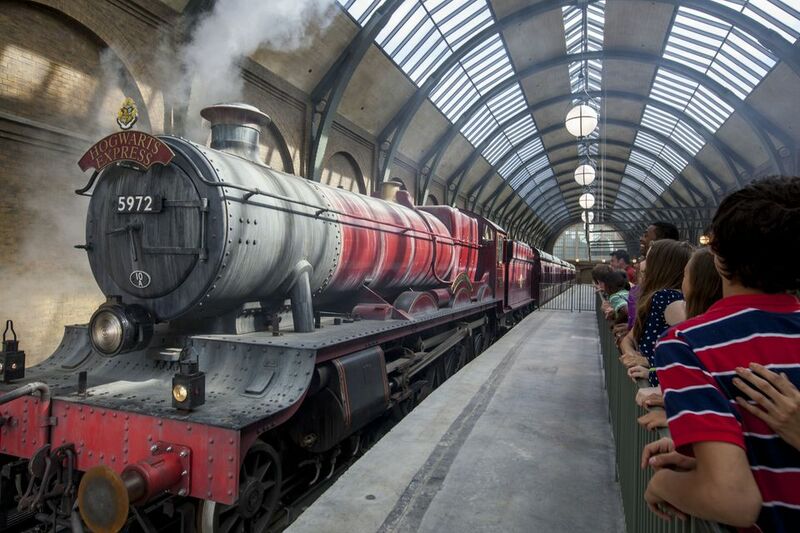 The railway attraction that links Hogsmeade Station in Islands of Adventure to King's Cross station in the London area of Universal Studios should be less crowded this time of year as well. You should consider staying on property at one of Universal’s resorts, as the fees are among the lowest of the year. If you splurge for one of the resort's luxury properties, Portofino Bay, the Hard Rock Hotel, or the Royal Pacific, all guests would get complimentary Universal Express front-of-the-line passes, which would be a great value. Although the restaurants in the parks, at Universal CityWalk, and at the hotels might be less crowded in January, you’d still want to book reservations ahead of time to ensure you'd have a seat for dinner. Despite low tourist numbers this time of year, many restaurants do fill up quickly at dinnertime.